We now offer guitar lessons at a studio near Yonge and Eglinton or at the Leaside Presbyterian Church on Thursday evenings. If you are interested in guitar lessons for yourself or your child, contact us as soon as possible to secure your spot. At Upbeat Piano Studio, we distinguish ourselves by our excellent teaching staff. Our teachers are passionate professionals who know how to bring out the best in their students. In addition to the classics, our lessons build around music that matches the students’ interests. While it requires self-discipline to learn an instrument and to understand music theory, we believe that making music should be a joyous experience to keep students engaged. We aim beyond just passing exams, with the ultimate goal of fostering a lifelong love of music. 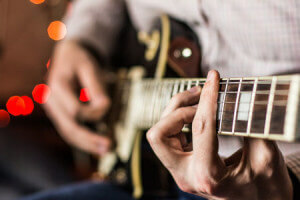 Our guitar lessons are tailored to meet students wherever they are in their musical journey. Beginners learn essentials including basic chords, melodies, and rhythm, while advanced students tackle more sophisticated concepts and learn new ways to apply their existing skills. Music and the arts are a vital part of the educational foundation. Taking music lessons often helps students learn to focus and self-regulate, two significant indicators of academic success. Researchers have found that music lessons, including guitar, increase students’ memory and improve math skills. In addition, the tangible progress students experience when they improve their skills builds self-confidence and self-esteem, while imparting the valuable lesson that patience and practice pay off. We look forward to sharing our musical passion with you or your child. To register or learn more about our guitar lessons, please contact us today!